Anonymity can play a central role in fostering abusive behavior online. But in many cases, targets of online harassment name someone they know personally as the responsible party. About one-in-four Americans (26%) who have been harassed online say an acquaintance was behind their most recent incident, according to a recent Pew Research Center report. And in other cases, targets of online abuse are even more familiar with their harassers: 18% of those who have been harassed say their most recent incident involved a friend, while 11% say it involved a family member. Smaller shares say their most recent experience involved a former romantic partner (7%) or a co-worker (5%). The severity of harassment people encounter varies little by whether or not they know their harasser. But there are some distinct differences in how these two groups react to their experiences. Those who know their harasser tend to be more deeply affected by their experience and to express greater concerns for their safety. 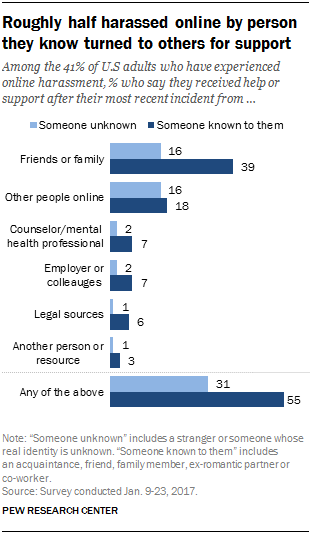 Among those harassed online by someone they know, 34% describe their most recent incident as extremely or very upsetting – twice the share among those who say their harasser was unknown to them (17%). Additionally, people harassed online by someone they know are roughly three times as likely to say they felt a threat of physical danger to themselves or people close to them during their most recent incident (17% vs. 5%). Those who know their harasser are also more likely to say the incident caused a range of problems, including difficulties with friends or family, damage to their reputation, mental or emotional stress or problems in their romantic relationships. A majority of both groups say they simply ignored their most recent incident of online abuse. But slightly larger shares of those who are familiar rather than unfamiliar with their harasser say they did respond in some way (45% vs. 34%). 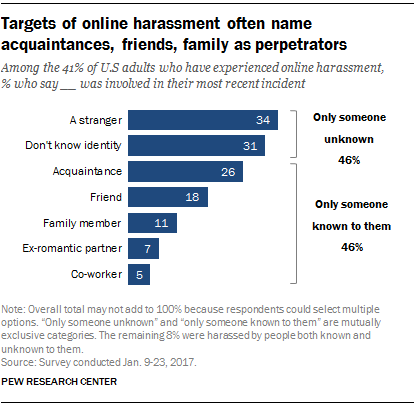 Among people who chose to respond, those who were harassed by someone known to them were especially likely to say they confronted the person face-to-face or over the phone (28% vs. 1% among those who did not know their harasser), changed their username or deleted an online profile (15% vs. 3%), or stopped going to offline events or places (11% vs. 3%). Those who have been harassed by someone they know are also more likely to turn to others for support: 55% sought out some type of help or support during their most recent indident, compared with 31% of those who were harassed by a stranger or somone anonymous. This group is especially likely to turn to other friends or family members for support: 39% did so after their most recent encounter, compared with 16% of those whose harasser was unknown to them.